Buying your first home is one of the most exciting times of your life. It marks a huge change. In Perth, it normally means moving out of your parents home. And living instead with your partner, or with friends. It means having plenty of space to create your ideal life. Here are some tips for choosing outdoor furniture for your new home. 1. Make the most out of your space. In WA, we pay a lot to own a house. And houses usually have large yards. Each section of space is important. Outdoor lounges, dining sets, and seats can help utilise every nook and cranny. No need for awkward spots that don’t get used. Outdoor space is living space. 2. Create your ideal entertaining space. Do you want to host parties? How many friends and family do you expect? It is all too common for backyard parties to feel uncomfortable, without enough seating. Be sure to create the ideal place for entertaining, with enough spots for all guests to eat and drink. Your home is your private resort. 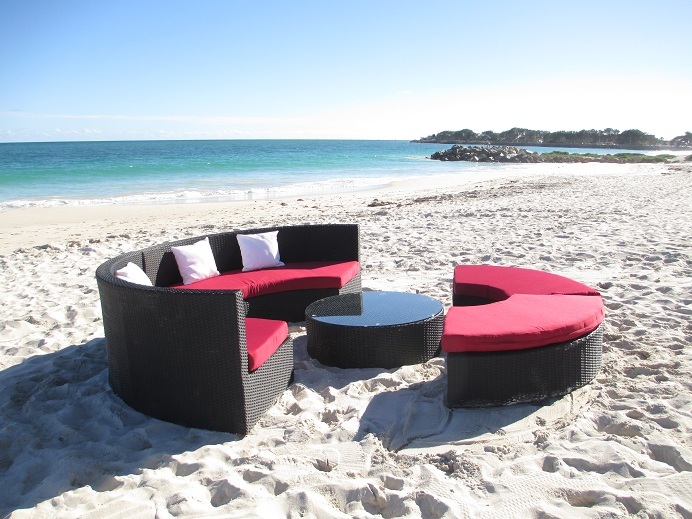 The circular design of this wicker setting allows everyone to see each other. 3. Choose your perfect colour and style. Furniture is a long term investment. Do you want a modern white rattan, or to create a Balinese look with a dark rattan? Choose your style carefully to coordinate with your indoor living space. If you change your mind, no problem. Urbani is incredibly affordable. Red is a favourite for outdoor cushions. 4. Create matching colours. Using matching colours creates a designer look. At Urbani you can order any wicker and cushion colour. Also, extra cushion covers are $199, if you ever change your style. We offer neutral colours like charcoal, black, and cream, as well as bold statements such as red, turquoise, or green. Be creative and wow your friends and family. Matching colours are uncommon, and create a designer look. We love providing affordable and modern wicker pieces to first home buyers. We are lucky to be located in Wangara, close to many new home suburbs such as Carramar, Tapping, and Landsdale. We want you to create your ideal entertaining area for your ideal live. And to create a designer look that will impress. Something you can be proud of, enjoy many glasses of wine, great food, and great company.